Pharmaceutical company is one of the leading export earning sectors in Bangladesh. The economy is mostly depended on export earning since it facilitates the increase in export earning of the country. Every people in the society suffer from several diseases and need medicine for come round from diseases. So it has a potential market for growing out. This report “Marketing Promotional strategy of Pharmaceutical industries in Bangladesh, a case study on Biopharma Laboratories Ltd.” is prepared based on the Marketing promotion strategy of pharmaceutical company. The report is about how Biopharma Laboratories Ltd differentiates the company from other competitors in terms of product performances, unique and effective promotion tools, image building activities, offering services etc. to gain customer satisfaction. This report has parts like- Introduction, Pharmaceutical sector of Bangladesh, Overview of Biopharma Laboratories Ltd, Main report – code and ethics on pharmaceutical promotion, types of Marketing promotion, Marketing promotional mix, Marketing Promotional activities for pharmaceutical companies and also for Biopharma Laboratories Ltd, and lastly conclusion and recommendation. Since my topic of internship is Marketing promotional tools for pharmaceutical companies, in the main report I discussed about various procedures of pharmaceutical promotion of pharmaceutical companies in Bangladesh and also the Marketing promotional activities of Biopharma Laboratories Ltd. Marketing Promotion is the key function of the company for selling more product and also gaining a competitive market share in pharmaceutical market and also increase the sales in international market. Marketing Promotional mix includes advertisement, sales promotion, personal selling, direct marketing, public relations, sponsorship, trade show etc. Advertising include Print ads, radio, television, billboard, direct mail, brochures and catalogs, signs, in-store displays, posters, motion pictures, Web pages, banner ads, and emails. Personal selling includes Sales presentations, sales meetings, sales training and incentive programs for intermediary salespeople, samples, and telemarketing. Sales promotion includes contests, product samples, rebates, trade shows, and exhibitions. Public relations include Newspaper and magazine articles/reports, charitable contributions, issue advertising, and seminars and symposium. All the activities are briefly described in the report. In the main body of the report I also comprise the sales of Biopharma Laboratories Ltd. before marketing promotion and after marketing promotion. Knowledge and learning become perfect when it is associated with theory and practice. For any business student only curriculum activity is not enough for handling the real business situation, therefore, it is a requirement after the completion of BBA to involve with a business organization to prepare a thesis report. So it is an opportunity for the students to know about the field of business through the internship program. To fulfill this requirement I was worked as an intern in Biopharma Laboratories Ltd. for three months. For the internship my preference was in pharmaceutical sector. I submitted resume for a viva-voce in the Biopharma Laboratories Ltd. I successfully passed the viva-voce and was appointed as an internship trainee in the Head Office of Biopharma Laboratories Ltd.
My assigned topic is “Marketing Promotional strategy of Pharmaceutical industries in Bangladesh, a case study on Biopharma Laboratories Ltd.” which is assigned by my supervisor in the department. On the basis of working experience in the internship period I have prepared this report and I have tried my level best to relate the theoretical knowledge with the practical work situation. Broad Objective: To describe the Marketing promotional activities of pharmaceutical product in Bangladesh and Biopharma Laboratories Ltd. itself. To describe codes and ethics of pharmaceutical industry. To describe all types of promotional tools used by pharmaceutical company. To describe all types of promotional tools used by Biopharma Laboratories Ltd.
To describe the procedure of using promotion tools. To describe the strategy for making a good promotion. To describe the procedure of managing promotional tools. To describe the procedure of benefits from promotion. It will be a descriptive type of study. The methodology of this report is totally different from conventional reports. I have emphasized on the practical observation. Almost the entire report consists of my practical observation. The report is fully exploratory in nature. Data have been collected from both primary and secondary sources. Face to face conversation with the company officers and staffs. Informal conversation with the doctors, MPO, RMP. Annual report of Biopharma Laboratories Ltd. Different manuals of Biopharma Laboratories Ltd. Different circulars of Biopharma Laboratories Ltd. The data have been used in this study are basically collected informally. This is totally an explorative study. As a result, data are collected by studying and reviewing the statement, circular and manuals of the organization. The relevant data was collected by informal discussion with the company officials regarding the business and promotion of the products that they produce to describe the present situation of pharmaceutical promotion in Bangladesh. Pharmaceutical sector in Bangladesh is one of the rising sectors which start its journey in 1950 in this sub-continent. The pharmaceutical industry, however, like all other sectors in Bangladesh, was much neglected during Pakistan regime. Most multinational companies had their production facilities in West Pakistan. With the emergence of Bangladesh in 1971, the country inherited a poor base of pharmaceutical industry. For several years after liberation, the government could not increase budgetary allocations for the health sector. Millions of people had little access to essential life saving medicines. With the promulgation of the Drug (Control) Ordinance of 1982 many medicinal products considered harmful, useless or unnecessary got removed from the market allowing availability of essential drugs to increase at all levels of the healthcare system. At present there are more than 200 pharmaceutical companies in Bangladesh and from those companies there are thirty to forty company are in good position in production of pharmaceutical products. All the companies are always trying to increase their market share and as a result they use several new techniques for promoting their own products though there is a strict limitation on promotion. In last year the sales of Opsonin increase by 57.03%, sales of ACI increases by 34.12%, the sales of Aristopharma increases by 32.7%, the sales of Drug International increases by 31.21%, sales of Incepta increases 27.35% all these indicate all the companies are trying to increase there sales using attractive promotional tools. Like any other study the limitations of this study is not out of questions. But the following factors seem to me as the some points of weakness of this study, despite all out co-ordination from the organization. One of the notable limitations of this report is sales report is not disclosing some data and information for obvious reasons, which could be very much useful. It was not possible all the time for observing all the Marketing promotional tools used in pharmaceutical sector both in national and international. It was impossible to find out the exact effect of marketing promotional tools used in pharmaceutical industry. Entrance to every nock and corner of the organization was not possible for me. Pharmaceutical sector is one of the most developed hi tech sector which is contributing in the country’s economy. Beginning in the 1950s, when a few multinationals and local entrepreneurs set up manufacturing facilities in the then East Pakistan, now over 200 companies produce now medicines in Bangladesh. After the promulgation of Drug Control Ordinance – 1982, the development of this sector was accelerated. The professional knowledge, thoughts and innovative ideas of the pharmacists working in this sector are the key factors for this development. Due to recent development of this sector we are exporting medicines to global market including European market. This sector is also providing 95% of the total medicine requirement of the local market. Leading Pharmaceutical Companies are expanding their business with the aim to expand export market. Recently few new industries have been established with hi tech equipments and professionals which will enhance the strength of this sector. The pharmaceutical industry, however, like all other sectors in Bangladesh, was much neglected during Pakistan regime. Most multinational companies had their production facilities in West Pakistan. With the emergence of Bangladesh in 1971, the country inherited a poor base of pharmaceutical industry. For several years after liberation, the government could not increase budgetary allocations for the health sector. Millions of people had little access to essential life saving medicines. With the promulgation of the Drug (Control) Ordinance of 1982 many medicinal products considered harmful, useless or unnecessary got removed from the market allowing availability of essential drugs to increase at all levels of the healthcare system. Increased competition helped maintain prices of selected essential drugs at the minimum and affordable level. Following the Drug (Control) Ordinance of 1982, some of the local pharmaceutical companies improved range and quality of their products considerably. The national companies account for more than 65% of the pharmaceutical business in Bangladesh. However, among the top 20 companies of Bangladesh 6 are multinationals. Almost all the life saving imported products and new innovative molecules are channeled into and marketed in Bangladesh through these companies. Multinational and large national companies generally follow current good manufacturing practices (cGMP) including rigorous quality control of their products. The Drug Act of 1940 and its rules formed the basis of the country’s drug legislation. Unani, ayurvedic, homeopathic and biochemical medicines were exempted from control under the legislation. The pharmaceutical industry was dominated by the foreign companies at that time. Even in the allopathic market there were extemporaneous preparations dispensed from retail pharmacies. In 1981, there were 166 licensed pharmaceutical manufacturers in the country, but local production was dominated by eight multinational companies (MNCs) which manufactured about 75% of the products. There were 25 medium sized local companies which manufactured 15% of the products and the remaining 10% were produced by other 133 small local companies. All these companies were mainly engaged in formulation out of imported raw materials involving an expenditure of Tk 600 million in foreign exchange. In spite of having 166 local pharmaceutical production units, the country had to spend nearly Tk 300 million on importing finished medicinal products. A positive impact of the Drug (Control) Ordinance of 1982 was that the limited available foreign currency was exclusively utilized for import of pharmaceutical raw materials and finished drugs, which are not produced in the country. The value of locally produced medicines rose from Tk 1.1 billion in 1981 to Tk 16.9 billion in 1999. At present, 95% of the total demand of medicinal products is met by local production. Local companies (LCs) increased their share from 25% to 70% on total annual production between 1981 and 2000. In 2000, there were 210 licensed allopathic drug-manufacturing units in the country, out of which only 173 were on active production; others were either closed down on their own or suspended by the licensing authority for drugs due to non compliance to GMP or drug laws. They manufactured about 5,600 brands of medicines in different dosage forms. 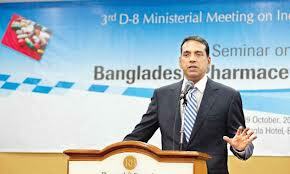 There were, however, 1,495 wholesale drug license holders and about 37,700 retail drug license holders in Bangladesh. Anti-infective is the largest therapeutic class of locally produced medicinal products, distantly followed by antacids and anti-ulcerate. There are three public sector drug manufacturing units. Two of them are the Dhaka and Bogra units of Essential Drug Company Ltd. (EDCL), which is functioning as a public limited company under the Ministry of Health and Family Welfare. EDCL produced medicines worth Tk 964 million in 2000. There are separate vaccines and large volume IV fluids production units under the Institute of Public Health (IPH). The productions of both EDCL and IPH are mostly used in government hospitals and institutions. In 2000, there were 261 unani, 161 ayurvedic, 76 homeopathic and biochemical licensed manufacturing units. They produced medicines worth Tk 1.2 billion in 2000. The annual per capita drug consumption in Bangladesh is one of the lowest in the world. However, the industry has been a key contributor to the Bangladesh economy since independence. With the development of healthcare infrastructure and increase of health awareness and the purchasing capacity of people, this industry is expected to grow at a higher rate in future. Healthy growth is likely to encourage the pharmaceutical companies to introduce newer drugs and newer research products, while at the same time maintaining a healthy competitiveness in respect of the most essential drugs. Bangladesh, currently having more than a couple of hundred manufacturing facilities with huge potential in pharmaceutical formulations, is heading on a new path of industry economic for self-reliance. Aiming at minimizing the import dependency on basic drugs, the country’s prime concern is about building up of own capability in the manufacturing of active pharmaceutical ingredients(APIs), base materials and other allied industry inputs. The sector is active in API (active pharmaceutical ingredients). Many companies now locally manufacture a good number of APIs. However, compared to large local demand, more API industries are needed to be set up. Pharmaceutical industries’ potential has multiplied with the recently approved API industrial park in Munshigonj. The API can save at least 70 per cent of the cost of import of pharmaceutical raw materials from aboard. Skilled professionals at home and abroad are joining the industry’s human resources pool every year. It is estimated that over $250 million have been invested in this sector over the recent years for facility modernization and setting up of new facilities. Pharmaceutical sector is capturing near about 12% of market capitalization which is the second largest. This position also indicates the positive sign for investment in pharmaceutical sector. The combined capacity of the industry for the pharmaceutical formulation is huge and a number of companies have recently got approval from UNICEF as its global as well as local supplier of pharmaceutical products. Though the country has all the potential to become a major global source of APIs and will also be able to produce drugs, which are still under patent protection, as the TRIPS Council meet at Doha has declared the least developed country (LDC) status to remain without patent regime till 2016, it needs active participation and contribution from local as well as foreign companies to build upon the capability. Presently top pharmaceutical companies in Bangladesh are also in the process of getting into bulk drug production with collaborative technology, technology transfers and joint venture basis. The large-scale players in the Bangladesh pharmaceutical industry currently include Square Pharma, Incepta, Beximco, Opsonin, Alma, Apson Chemicals, FEI, Araneta, General Pharma, Hudson Pharma, Biopharma and SKF among others. The MNCs that have a major presence in the country’s pharma sector are Aventis, Pfizer, Novartis, Glasko-Smith and Astra Zeneca. There are about 450 generics/substances registered in Bangladesh. The total number of brands/ items that are registered in Bangladesh is currently estimated to be 5,300, while the total number of dosage forums and strengths are 8,300. The finished formulation-manufacturing base of Bangladesh is very strong and all of the pharmaceutical companies have their own manufacturing facilities. 96% of the total demand of Bangladesh is being met by local manufacturing. The remaining 4% basically constitutes import of very specialized products like Vaccines, Anticancer products etc. We have already become self-sufficient in some areas of Active Pharmaceutical Ingredients (APIs) namely, Penicillin, Cephalexin, NSAID and Anti-Pyretic. We have also developed some new and exciting APIs like Celecoxib, Refecoxib, Ciprofloxacin, Ranitidine, Amlodipine, and Fluconazole, Cetirizin etc., which have huge local and international demand. The pharmaceutical industry of Bangladesh in now capable of producing drug products meeting the highest quality standard. It maintains high standard of Quality Assurance in the manufacture and control of drug and drug products. A competent regulatory known as the Directorate of Drugs Administration, Bangladesh ensures compliance of the manufacturing facility and practices with the requirements of CGMP (Current Good Manufacturing Practice) and regulations. Bangladesh has manufacturing facilities meeting the highest CGMP requirements. Quality Control Laboratories are equipped with sophisticated equipment and meet the requirements of CGMP. Specifications and test methods for raw materials and drug products are based on British Pharmacopoeia (BP) , United states Pharmacopoeia (USP ) and European Pharmacopoeia (EP). Goof Manufacturing Practice (GMP) is the basic concept for maintaining quality control of finished drugs and medicines. A few pharmaceutical companies in Bangladesh received internationally acclaimed “ISO 9001 & 9001:2000 Certificate” in recognition of their quality. For achieving such recognition the door has been opened and has got access to the Asian, European & African market for Bangladesh products. Quality Assurance System in place ensures that the facility, equipment, process and test methods are validated and instruments are calibrated. Qualified and trained personnel are employed in the manufacture and testing of drug products. Products are released only after review by Authorized person. With regards to raw materials sourcing, the pharmaceutical manufacturers in Bangladesh procure raw materials from various countries namely UK, France, Germany, Japan, Holland, Italy, Denmark, China, Switzerland, Austria, Hungary, India, Ireland etc, In case of raw materials that are locally manufactured, we do not go for import. Bangladesh could fulfill the national aspiration of turning its pharmaceutical industry into an exporter of quality medicines. We have already started our overseas business and as our first move towards internationalization, we entered few overseas markets with the export of our basic chemical. So far, we have exported our basic chemicals to few countries namely, Iran, Hong Kong, South Korea, Malaysia, Taiwan, Vietnam, Thailand and Nepal. After being very successful in exporting basic chemicals, few leading companies also started registering and exporting their finished formulations in various countries namely, Russia, Pakistan, Myanmar, Vietnam, Sri Lanka, Nepal, Kenya and Yemen. Today, most of the leading pharmaceutical manufacturers of Bangladesh are involved in export operations. It is estimated that over $250 million have been invested in this sector over the recent years for facility modernization and setting up of new facilities. Bangladesh has been trying to fulfill the national aspiration of turning its pharmaceutical industry into an exporter of quality medicines. In mid 90’s a few companies took initiatives to export pharmaceuticals from Bangladesh. Today, Bangladesh is exporting its pharmaceuticals to various countries like Bhutan, China, Columbia, European Union, Ecuador, Georgia, Germany, Hong Kong, India, Iran, Kenya, Kuraso, Kampuchea, Malaysia, Myanmar, Maldives, Mauritius, Mexico, Nepal, Pakistan, Philippines, Russia, Singapore, Sri Lanka, Sudan, South Korea, Laos, Tazakistan, Taiwan, Thailand, Tunisia, Uzbekistan, Ukraine, USA, Vietnam, and Yemen. It is worth mentioning that the world renowned hospitals & institutions like, KK Women & Children Hospital and Raffles Hospital of Singapore, MEDS of Kenya and Zinnah Hospital of Pakistan have been using the pharmaceutical products of Bangladesh. Bangladesh has been exporting wide range of products covering almost all therapeutic classes and dosage forms. Apart from exporting tablet, capsule, syrup, suspension, ointment etc., it also exports ‘High Tech and Specialized products’ like Metered Dose Inhalers (MDIs), Nasal Sprays, Suppositories, Large Volume Potentials (LVP) and small Volume Potentials (SVP). The year 2005 is going to open the door to “Enormous Export Opportunities” for Bangladesh Pharmaceutical Sector. Bangladesh will be allowed to manufacture and export pat ended drugs to 48 Least Developed Countries (LDC) of the world. Among all 49 LDC’s Bangladesh is the only country which has a strong base in Pharmaceuticals. The Country can fetch as much as 500 billion US Dollar by exporting pharmaceutical products. The quality and efficacy of the products being exported from Bangladesh have been highly appreciated in all the countries we are exporting. All these products are gaining remarkable brand equity in most of the overseas markets. The packaging and presentation of the pharmaceutical products manufactured in Bangladesh are comparable to any international standard and have been highly appreciated by the doctors, chemists and patients of all the countries, we are exporting. Bangladesh is now on the verge of entering highly regulated overseas markets like USA and Europe. In this connection, three major pharmaceutical manufacturers have already made huge investments in their new plants/factories. One of the companies has already received MCA Certificate and has started exporting to Europe. The other two companies are also going to apply for USFDA and MCA Certifications. BIOPHARMA was established in 1973 as limited company. It sailed its new journey in 1999 with the involvement of a group of physicians with innovative mission and global conception. Biopharma is one of the fast growing pharmaceutical companies in Bangladesh. Biopharma is now manufacturing more than 150 products including life saving drugs at affordable price and committed to serving the need of ailing community with products of excellent quality, safety and efficacy complying the guideline of WHO cGMP and Quality Management System. Biopharma has gained a leading edge in many important therapeutic groups including Antibiotics, Antiulcerants, and Laxative, Bronchodilator, NSAIDs, Vitamins & minerals, Cardiovascular and Dermatological products. BIOPHARMA is always committed to assure the best quality pharmaceutical products and best services to the customers. Our mission is to serve the mankind, especially the distressed and poor ailing people and our vision is to be regarded globally as a Quality pharmaceutical manufacturer through the best quality pharmaceutical products. Bearing this in mind, our technical experts (pharmacist, Chemists, Biochemists, Microbiologists Analysts and other professionals ) skilled and trained staffs always try to leave no stone unturned in their professional works by following the US cGMP, British & WHO GMP guidelines and the guidelines & instructions of the Drug Administration & Licensing Authority of Bangladesh to ensure the production of quality medicine. Ever since we at GLP (Good Laboratory Practices) have always been performing with a strict discipline to follow our professional ethics. By virtue of the highest quality of drugs, the company has already obtained the confidence and trust of doctors and patients all over Bangladesh and earned excellent reputations in the market through introducing very exciting new molecules and dosage forms in many therapeutic areas. We are now producing a wide range of Biological and pharmaceutical products in different dosage forms and presentations including tablets, capsules, syrups, suspensions, powder for suspensions, pediatric drops, sterile creams & ointments and inject able preparations. Biopharma mission is to build strength carefully in important areas that offer the resources for tomorrow’s business opportunities. Biopharma’s vision is to play the leading role in the country’s health sector by providing safe and effective medicine of high quality which will bring benefit to patients through improved longevity and quality of life. Code of Pharmaceutical Marketing Practices (CPMP) is an essential instrument to ensure the rational use of medicines. Formulation of this Code for Bangladesh will accord a new dimension to our continued efforts to develop the pharmaceutical services of our country. A pharmaceutical company should provide the member of the health profession with a data sheet while promoting the product to him. The content of such data sheet should be approved by the licensing authority. All other printed materials which is issued by the product license holder or with his authority should comply to the content of the data sheet and must include certain information specified hereunder in this code. The name and address of the holder of the license, or the name and address of the part of his business, responsible for the promotion of the product. A quantitative list of the active ingredients, using approved names where such exist, or other non-proprietary names; alternatively, the non-proprietary name of the product if it is the subject of an accepted monograph. At least one authorized indication for use consistent with the data sheet. A succinct statement of the information in the data sheet relating to the dosage and method of use relevant to the indications quoted in the advertisement and, where not otherwise obvious, the route of administration. A succinct statement of the side -effects, precautions and contra indications relevant to the indications in the advertisement; the substance of the relevant information in the data sheet being given in a concise form. Any warning issued by the Licensing Authority which is required to be included in advertisements. (ii) The information required by Clause 3.1.3 (i) (d), (e) and (f) must be printed in such type and in such a position that its relationship to the claims and indications is readily appreciated by the reader. The brand name of the product. The approved names of the active ingredients, where such names exist, or other non- proprietary names; alternatively, the non – proprietary name of the product if it is the subject of an accepted monograph. The name and address of the product license holder, or the name and address of the part of his business responsible for the promotion of the product. One indication for use or more than one indication provided that these are in accordance with the data sheet. A concise statement, consistent with the data sheet, giving the reason why the product is recommended for such indication or indications. A form of words which indicates clearly that further information is available on request from the license holder or is to be found in the data sheet relating to the product. (ii) An abbreviated advertisement must always contain the information required by Clause 3.1.4 (i) (a), (b) , (c) and (f). The information required by Clause 3.1.4 (i) (d) and (e) is optional. An abbreviated advertisement must not include any illustration which is likely to convey any information about the product or imply claims which are additional to those provided in accordance with Clause 3.1.4 (i) (a) to (e) inclusive. (iii) An abbreviated advertisement directed towards a doctor is permissible only when it constitutes ad advertisement appearing in a publication sent or delivered wholly or mainly to doctors. A loose insert included in such a publication cannot be an abbreviated advertisement. (iv) An abbreviated advertisement cannot appear as part of another promotional item, such as in a brochure consisting of a full advertisement for another of a company’s products. (v) An abbreviated advertisement is not permissible where the licensing authority has required a warning to be included in any advertisement relating to the medical product, and/or the licensing authority has issued a direction that abbreviated advertisements should not be issued. Promotional materials, such as mailings and journal advertisements, must not be designed in a manner which may obviously defeat its purpose. Promotional material should conform, both in text and illustration, to the standards of good taste and should recognize the professional standing of the recipients. Relevant human figures and photographs may be used in promotional materials subject to approval of licensing authority. Such illustration should respect the tradition, culture and social values of the people of Bangladesh. Doctors’ names, photographs or a prominent portrait must not be used in a promotional material or in any other way by which any individual doctor may be identified or the ethical code of the medical profession is contradicted. Promotional materials should not imitate the devices, copy slogans or general layout adopted by other companies in a way that is likely to mislead or confuse. Where appropriate, for example, in technical and other informative material, the date of printing or the last review should be stated. No advertisement included in a journal may consist of more than two consecutive pages. Postcards, other exposed mailings, envelopes or wrappers should not carry matter which might be regarded as advertising to the lay public or which could be considered unsuitable for public view. Telephone and Telex messages must not be used for promotional purposes. In a two page journal advertisement only one page need include the information required by Clause 3.1.3 of the Code provided that the other page (except where it faces the page on which the information is printed) includes a reference, on an outer edge, in at least 8 point type, indicating where that information appears. Where the two pages of the advertisement are not facing, neither must be false or misleading when read in isolation. Where an advertisement consists of a double -sided insert in a journal, neither side must be false o r misleading when read in isolation. In a multi-page advertisement, the information required by Clause 3.1.3 of the Code must appear on one or more continuous pages and where such an advertisement consists of more than four pages, the advertisement must include a clear indication as to the location of this information. Promotional materials should be used within two years of its approval by the licensing authority. However, fresh approval may be obtained for further use. Promotional material should not include any reference to the Committees formed by the government or to the licensing authority, unless this is specifically required by the licensing authority. Art Work, Graphs, Illustrations Etc. Illustrations must not mislead as to the nature of the claims or comparisons being made, nor as to the purposes for which the product is used; nor should illustrations distract from warnings or contra-indications. Art work illustrations must conform to the letter and the spirit of the Code. Graphs and tables should be presented in such a way as to give a clear, fair, balanced view of the matters with which they deal, and should only be included if they are relevant to the claims or comparisons being made. Graphs and tables must not be used in any way which might mislead; for example, by their incompleteness or by the use of suppressed zeros or unusual scales. It is only permissible to include in promotional material reasonably brief abstracts of, or quotations from, articles by members of the medical profession and to include in such materials reference to doctors names in a bibliography of published works. In no case, however, should doctor’s names be used in a prominent manner in promotional material. Quotations from medical literature, or from personal communications received from doctors, must accurately reflect the meaning of the author and the significance of the study. Quotations relating to medical products taken from public broadcasts (e.g. audio and television) and from private occasions, such as medical conferences or symposia, should not be used without the written permission of the speaker. The utmost care must be taken to avoid ascribing claims or views relating to medical products to authors when such claims or views no longer represent or may not represent the current views of the authors concerned. Promotional material should only be sent or distributed to those categories of health-care professionals whose need for; or interest in, the particular information can reasonably be assumed. Any information designed to encourage the use of medical products in clinics, industrial concerns, clubs or schools must be addressed to the medical staff only. Mailing lists only include those healths -care professionals as defined in this code. Requests from doctors to be removed from promotional mailing lists must be complied with promptly and no name may be restored except at the doctor’s request or with his permission. Audio-visual material qualifying as promotional material must comply with all relevant requirements of the Code, with the exception of Clause 3.1.3. When audio-visual material is used to promote a product, the information required by Clause 3.1.3 (i) of the Code must be provided either by way of a document made available to all persons to whom the material is played or shown, or to whom it is sent or except in the case of material which consists of sound only, by way of inclusion as part of the audiovisual material. Wherein the information required by Clause 3.1.3 (i) is provided as part of the audio-visual material, it must appear visually in or with the advertisement and be of sufficient clarity and duration that it can be read easily. Promotional material which is made available to hospitals, doctors, pharmacists etc., by systems which enable the material to be accessed and reproduced on to television apparatus, visual display units arid the like, must comply with all relevant requirements of the Code, with the exception of Clauses 3.1.3 and 3.1.14. Such material includes view data systems, memory discs and the like, but not video-tapes, which come within the scope of Clause 3.8. The obligatory information required by Clause 3.1.3 (i) (a) – (f) must be available through the system conveying the promotional material and instructions for accessing that information must be displayed with the promotional material. Promotional material made available in this way is subject to the certification requirements of Clause 3.9. No promotional material shall be issued unless the final text and layout have been certified on behalf of the company by an authorized person in the manner provided by this clause. The authorized person shall be a pharmacy graduate or a medical graduate. The authorized person may be a full time employee of the company or retained by the company. The retainer ship of an individual by more than one company is not allowed. The names of authorized persons, together with their qualifications, shall be notified in advance to the licensing authority. Changes in the names of the authorized persons must be promptly notified to the Licensing Authority. The certificate shall certify that the signatories have examined the material in its final form that in their belief it is in accordance with the requirements of the relevant advertising regulations and this Code of Practice, is consistent with the product license and the data sheet, and is a fair and truthful presentation of the facts about the product. Companies shall preserve all certificates, together with the material in the form certified, for not less than three years and produce them upon request from the Licensing Authority or the appropriate committee formed by the government. The foregoing procedure shall apply, with the necessary variation, to audio-visual material prepared by or on behalf of companies in accordance with Clause 3.6, to promotional material provided by or with the authority of companies for reproduction on television apparatus, visual display units and the like in accordance with Clause 3.8. In the event of the Code of Pharmaceutical Marketing Practices Committee (CPMPC) requiring a company to suspend a practice or the use of an advertisement pending its decision on a complaint relevant to the safe or proper use of the product; the company shall comply forthwith. Medical Representatives must be adequately trained and possess sufficient medical and technical knowledge to present information on the company’s products in an accurate and responsible manner. Medical Representatives should at all time maintain a high standard of ethical conduct in the discharge of their duties. The requirements of the Code which aim at accuracy, fairness, balance, and good taste apply to oral representations as well as printed material. Unfair or misleading comparisons must be avoided by Medical Representatives. Claims made for products by medical representatives must be limited to the indications permitted by the product license. Medical representatives must not employ any inducement or subterfuge to gain an interview. No payment of a fee should be made for the grant of an interview. Medical representatives must ensure that the frequency, timing and duration of calls on doctors, or on hospitals, together with the manner in which they are made, do not cause inconvenience. The wishes of an individual doctor, or the arrangements in force at any particular establishment, must be observed by medical representatives. Medical Representatives must take adequate precautions to ensure the security of medical products in their possession. Medical Representatives must not use the telephone to promote products to the medical profession unless prior arrangement has been made with individual doctors. Medical representative’s compensation should be such so as not to encourage unethical practices. When discussion about a product is initiated by a medical representative, he should be able to place before the doctor for reference, on request by the doctor, the approved data sheet of the product. Companies should prepare detailed briefing material for medical representatives on the technical aspects of any product which the medical representative is to promote. Briefing material must comply with the relevant requirements of the Code and, in particular, is subject to the certification requirements. Medical representatives should not make a claim for a product based on the regulatory management of that product, or of competing products, or based on any warnings issued in relation to other products, unless in accordance with a specific requirement. However, a medical representative may refer to such matters in answer t o a specific question. A company may only employ as medical representatives persons who are graduates in science and have undergone at least 4 weeks training on the relevant fields. Where the company so desires samples of pharmaceutical products may be supplied to the medical and allied professions to familiarize them with the products, to enable them to gain experience with the product in their practice, or upon request. Free samples for legally available medicines may be provided in modest quantities to the prescriber. Free samples for legally available non -prescription medicines should not be provided to the general public for promotional purpose. However, subject to the approval of the Licensing Authority, exceptions may be made with certain categories of medicines, which may be distributed to the general public or to certain groups of people for promotional purpose. Such categories of medicines may include nutritional supplements, oral rehydration substances, birth spacing medicines & devices etc. No samples should be mailed to doctors except in response to a request. Samples which are sent by post must be packed so as to be reasonably secured. Where samples of “Prescription only” products are distributed by a representative, the sample must be handed direct to the doctor or given to a person authorized to receive the sample on his behalf. A similar practice must be adopted for products which would be unsafe to use except under medical supervision. Distribution of samples in hospitals should comply with individual hospital regulations, if any. Subject to Clause 19-2, no gift or financial inducement shall be offered or given to members of the medical profession for purposes of sales promotion. Gifts in the form of articles designed as promotional aids, whether related to a particular product or of general utility, may be distributed to members of the medical and allied professions provided the gift is not unreasonably expensive and relevant to the practice of medicine or pharmacy. The name of the product license holder or the name of that part of his business responsible for the promotion and/or sale of the product. The address of the product license holder or the address of the part of his business responsible for the sale of product. An indication that the product name is a trade mark. For the promotional and of the type mentioned in clause 19.2 if brand name is mentioned it must also carry the generic name of the product and the company identity. Entertainment or other hospitality offered to members of the medical and allied professions for purpose of sales promotion should always be secondary to the main purpose of the meeting. It should not extend beyond members of the professions. The level of hospitality should be appropriate and not out of proportion to the occasion. Requests from individual members of the public for information or advice on personal medical matters must always be refused and the enquirer recommended consulting his or her own doctor. Medicines which cannot legally be sold or supplied to the public otherwise than in accordance with a prescription, or which are legally limited to promotion for sale or supply only on prescription, must not be advertised to the general public. (ii) Over the counter drugs. The licensing authority will determine the classification of a product. Advertisement to the general public in lay press may be permitted for over the counter medicines subject to prior approval of the licensing authority. Statements must never be designed or made for the purpose of encouraging members of the public to ask their doctor to prescribe a particular product. Information about medical products or matters related thereto, including scientific discoveries or advances in treatment, should not in general be made available to the general public either directly or through any lay medium. The importance of such information and the existence of legitimate public interest in acquiring it may exceptionally justify holding a press conference or the issue of a press release. Invitations to attend such a conference, or the distribution of such a press release, should be confined to persons who are qualified either in medical, pharmacy or nursing profession, or established as the representatives of the medical, pharmaceutical or scientific press, or as the medical correspondents of a responsible medium. In the circumstances set out above as to the significance of the information, and in response to an unsolicited enquiry from a person of the standing described, information may also be released in an informal manner. A further exception may be acceptable when there exists a genuine mutual interest of a financial or commercial nature justifying the disclosure of information about medical product or related matters privately or to a restricted public. Examples are the interests of shareholders, financial advisers, employees and creditors. On all occasions the information whether written, or communicated by other means, must be presented in balanced way so as to avoid the risk of raising unfounded hopes of successful treatment or stimulating the demand for prescription of the particular product. An announcement of the introduction of a new medical product must not be made by press conference or formal press release until the appropriate steps have been taken to inform the medical profession of its availability. Pharmaceutical companies have come under increasing scrutiny for their promotional practices (manner in which they market and sell their products to healthcare professionals and the general public), especially in light of allegations of misleading advertisements on prescription drugs and improper gifts to physicians. Biopharma Laboratories Ltd. has a strict position on the ethical promotion of pharmaceuticals so that the public can be confident that choices regarding their medicines are being made on the basis of the merits of particular products and their needs as patients. In Bangladesh pharmacies enjoy a percentage of free drugs during bulk purchases along with undeclared amount of discounts. The drug companies on some occasions make deals with pharmacies to create an artificial crisis so as to facilitate some pharmacies to enjoy a monopoly business. Unethical drug promotion and marketing of substandard and unnecessary drugs in Bangladesh were very common before 1982. Instead of producing essential drugs, most drug manufacturers manufactured nonessentials such as vitamins, tonics, enzymes, gripe waters and cough mixtures. Of the 300 pharmaceutical companies in Bangladesh, only the 20 to 25 top ones produce drugs of standard quality. Numerous small companies market substandard drugs in the country. Fake or substandard medicines, including lifesaving ones, with an estimated worth of US$ 150 million per year, are flooding the domestic market Good Manufacturing Practice (GMP) is a major criterion to maintain standard quality in drugs, and it was one of the principal objectives of the National Drug Policy to ensure standard manufacturing practices for drug manufacturers. But there are some 265 pharmaceutical companies in Bangladesh that do not follow or comply with GMP. It is widely alleged that adulteration flourishes in the country because of poor government vigilance and supervision over drug manufacturers and sellers. Unfortunately, a section of corrupt physicians and government officials is involved in these underhand dealings. The government states that it has limited workforce and facilities to handle difficult situations with the country’s fast expanding pharmaceuticals sector. In fact, the regulatory authorities have given scant attention to quality matters in Bangladesh. Inadequate supply of essential drugs, substandard quality, uncontrolled drug prices and inappropriate uses of drugs are major problems in Bangladesh. The drugs control authorities should be better equipped and more vigilant to handle difficult situations. Health professionals and drug manufacturers should be more committed to achieve the goals of the National Drug Policy. Promoting misleading or false claims about a drug should be change. Deliberately suppressing risks and side effects of a drug. Providing financial incentives to doctors for prescribing a drug to consumers should be stopped. Using disease awareness campaigns for drug promotion rather than health promotion. Compensation for healthcare professionals must be provided only for actual, reasonable and necessary services. Promotion involves disseminating information about a product, product line, brand, or company. It is one of the four key aspects of the marketing mix. (The other three elements are product marketing, pricing, and place). “Promotion is all about companies communicating with customers”. Marketing Promotion, especially advertising, tends to have more glamour than do the other mix components. It is certainly more visible and often appears to be more creative. The other elements are of little value unless their advantages are communicated to those who need to know. On the other hand, promotion cannot long succeed if the other elements of the marketing mix are unsatisfactory. Marketing Promotion can sell a good promotion or service, but it can not take the place of it or sustain poor products or services for long. Promotion in the media (e.g. TV, radio, newspapers, Internet and Mobile Phones) in which the advertiser pays an advertising agency to place the ad. All other promotion. Much of this is intended to be subtle enough for the consumer to be unaware that promotion is taking place. E.g. sponsorship, product placement, endorsements, sales promotion, merchandising, direct mail, personal selling, public relations, trade shows. Increasing the perceived frequency and/or severity of the indications. Widening the indications to include more people. Increasing the perceived likelihood and magnitude of benefits. Decreasing the perceived likelihood and magnitude of harms. Increasing the use of the drug of longer durations. The main aim of promotion is not to inform but to persuade. Consumer goods advertisements rarely convey much information about the feature of the product. Instead the emphasis of much advertising is on associating consumption of the product with positive feeling. Doctors are the main targets for the promotion activities of drug companies in developing countries. With the power to prescribe and a high status in society and their opinion of a drug very often determines its sales success. It is therefore not surprising that the majority of marketing expenditure by industry leaders go towards direct-to-direct (DTD) promotion. Health professionals are targeted by companies mainly via medical representatives and advertisements placed in medical journals or brochures that are sent directly to the doctors. Most of the drug manufacturers try to identify the customers’ behavioral pattern as sophisticated marketing techniques to motivate them to move one or more stages towards repeat use of their drugs. Each move requires motivation and decision making, so drug companies study how to understand human motivation and decision-making. Furthermore, a communication strategy is the design, planning, implementation, and controlling of integrated communication activities. As the below figure shoes, the strategy is involved with four different aspects of communication, namely, the selection of the message, target, medium, and frequency most suitable to the particular pharmaceutical product. The main elements of the promotional mix have been mentioned as collection of all the promotion activities. Advertising is defined as a non personal, paid communication about an organization, product, or idea by an identified sponsor. Personal selling is direct communication with customers to generate a response and/or a transaction. Public relation is the evaluation of public attitudes and the execution of plans to gain public understanding and acceptance. Furthermore, sales promotion is providing extra value or incentive to customers to purchase a product. The characteristics of each of these promotional channels as they relate to the pharmaceutical marketing are summarized in below table. Table 5.1: communication tactics in promotion mix of pharmaceutical. Above the four promotional tools are the main promotional tools in pharmaceutical promotion mix but there are another two promotional tools in promotion mix that are direct marketing and sponsorship. Any paid presentation and promotion of ideas, goods, or services by an identified sponsor. There are several types of advertisement for example, Print ads, radio, television, billboard, direct mail, brochures and catalogs, signs, in-store displays, posters, motion pictures, Web pages, banner ads, and emails. A process of helping and persuading one or more prospects to purchase a good or service or to act on any idea through the use of an oral presentation. Personal selling involves selling a product or service on a one to one basis. This can either be done face to face or over the phone. If the organization is using a pull strategy to sell the product a sales force will be required to make sure that retail outlets are looked after well, that they have enough stock, are trained well so they can push the product onto the consumer. With a push strategy the sales force will need to try and persuade retail outlets to carry stock of ones product. Examples: Sales presentations, sales meetings, sales training and incentive programs for intermediary salespeople, samples, and telemarketing. Can be face-to-face or via telephone. Media and non-media marketing communication are employed for a pre-determined, limited time to increase consumer demand, stimulate market demand or improve product availability. The aim of sales promotion is to increase short term sales and increase in-store or web traffic. Examples: Coupons, sweepstakes, contests, product samples, rebates, tie-ins, self-liquidating premiums, trade shows, trade-ins, and exhibitions. Paid intimate stimulation of supply for a product, service, or business unit by planting significant news about it or a favorable presentation of it in the media. Managing public relations is very important for the organization. Image in marketing is everything. Having a good image helps the organization develop a trust and a bond between themselves and their customers. This good will is invaluable. Examples: Newspaper and magazine articles/reports, TVs and radio presentations, charitable contributions, speeches, issue advertising, and seminars. Sponsorship is about providing money to an event, in turn the product or company is acknowledged for doing so. For example in different trade show sponsors all the arranging cost or part of the cost to that show. The aim of direct marketing is to create one to one relationships with the organizations target market. Direct marketing can come in the form of post, email, telephone calls and mail order. The company usually contacts a named person at the address. Viral marketing occurs when consumers pass on or recommend your product/company/website to others. This could be via email, or bulletin boards or word of mouth. There have been many well known online viral marketing campaigns. These include The Blair Witch Project and the establishment of Hotmail as a leading free email provider. In deciding the proper promotional mix it should consider the nature of the product because the promotional tools and strategy differ from product to product. In risk and benefit relationship here the firm should consider and measure the risk and benefit relationship of the product. If there is excessive promotion or less promotion for promoting a product then there should be degree of exploration required for successful use. If there is no potential for demonstration of the promotional tools then the promotional budget will face in loss. So there should be considering the potential for demonstration. Before deciding the promotional mix of pharmaceutical companies there should be consider the position of the product in its lifecycle. If the product is at its introduction and growth stage then the promotional budget should increase. On the other hand if the product is at maturity and decline stage then the promotion should be decrease or in constant rate. In deciding the promotional mix the firm should decide the market share of the product. If it wants more market share then the promotional mix should increase. The promotional mix varies from industry to industry. For example the promotional tools for pharmaceutical industry and the promotional tools for mobile industry are not same. If there is more competition among the companies then the promotional tools should be meaningful on the other hand the company will lose its market share. If the market has a low demand then the promotional tools do not play vital role for increasing the sales of the company. On the other hand if there is high demand in the market then there should be more promotional tools for acquiring more market share. In terms of pharmaceutical promotional tools the company should consider from where the customer will collect their product. Here the firm should consider the bargaining power of the product. In terms of pharmaceutical product here the bargaining power of customer is lower than other types of product. In pharmaceutical promotion the firm should consider the physical distribution system of the firm. In any types of promotion in pharmaceutical products there are some rules and regulations that should be consider. Social climate is one of the most effective factors that influence the promotional tools in pharmaceutical companies. All the activities of any organization depend on financial position of that organization. In terms of pharmaceutical promotion the firm should consider the financial resources of the organization. Promotional tools are those gift items and other incentives provided to those who are involved with that product purchase and sell. So the pharmaceutical company should consider the traditional promotional perspective of the company’s product. In terms of pharmaceutical promotional mix there should be consider the relative price of the product and also the relative quality of the product. Advertisements used by Biopharma Laboratories Ltd. are given as below. In pharmaceutical industry it is strictly maintain some rules and regulations for printed advertisement. Biopharma Laboratories Ltd. use some printed materials for their advertisement for example printed advertisement for medicine store and RMP chamber and also some place where all the activities are surround to pharmacy. Biopharma Laboratories Ltd. provides its advertisement in newspaper in terms of recruiting new employee most of the time for recruiting MPO. As of government rules and regulation no pharmaceutical company can not display their product advertisement through newspaper. So the company provides newspaper advertisement when it published any vacancy announcement. In terms of pharmacy related magazine Biopharma Laboratories Ltd. provides advertisement in that magazine. Here the company can provide an overview of the company and also the product catalogue. With the help of medical journal most of the pharmaceutical company provides their advertisement and also try to involve with that magazine. Biopharma Laboratories Ltd. involved them in publishing such types of journal and provides information for their customers. Show card are one type of broachers that are given by the company to its drug promoter to get knowledge about the new and upcoming product. Show card also help the firm to increase the sales of the company. Biopharma Laboratories Ltd. sometimes use direct mail as a tools for promoting their product both in country and in foreign market. They mail to the doctor, and other party in foreign market who are involved in trading pharmaceutical product. Biopharma Laboratories Ltd. use brochures and catalogs for introducing their product in new market. They provide catalog which contain the product name and price and also contains overall information about the product. These types of promotional material are widely used in international marketing. As brochures and catalogue Biopharma Laboratories Ltd. use leaflet and show card. At present Biopharma Laboratories Ltd. use in-store promotion for promoting their product. In in-store promotion here Biopharma convince the pharmacy owner and take space in shelf for placing the Biopharma Laboratories Ltd.’s product. In several trade show and product inauguration ceremony and launching new or existing product in international market Biopharma Laboratories Ltd. use posters as tools for promoting the products. Now a day’s online advertisement is widely used for promoting pharmaceutical products. Biopharma Laboratories Ltd. has its own website for promoting their products and also places their product in some sites for exploring new international market. Biopharma Laboratories Ltd. uses banner in several pharmacy and sometimes they use banner ad for increasing public awareness in several issue and also they use banner ads in several trade shows and also promote their products in international market. Biopharma Laboratories Ltd. uses e-mail as a tool for promoting their products. Through e-mail Biopharma Laboratories Ltd. mail doctors and pharmacists and also foreign delegates in several occasions. Biopharma Laboratories Ltd. arranges sales presenting in several times with their Medical Promotion Offices and it also helps the MPO to explore new tactics for promoting the company products. Sales meeting is one of the effective means of promotion. Company arrange sales meeting with the MPO, regional sales manager, and employee of the sales department and the employee of PMD. Through sales meeting the company gives incentive to the successful sales personal and the successful MPO of the year and this types of program motivate other employee of the company and they always try to improve or increase the company sales. Biopharma Laboratories Ltd. provide training to its Medical Promotion Officer (MPO) to provide better knowledge about the new and existing medicine of the company product and the product from the competitors. Through the training the company also teaches their MPO’s new technique about promoting the company product at the same time increase the sales of the company. To promote the company product the company arranges training to the Rural Medicine Practitioner (RMP) to get introduce them to the invention of the company product and also how they prescribe their patient in different types of diseases. Those types of activities attract more to the RMP and they prescribe or provide the company product to their customer. Biopharma Laboratories Ltd. arranges frequent training for the doctors to introduce their product to the doctor. Through those types of promotion the company able to get attention from doctors and those types of promotion activity increases the prescription of the company’s product. Sometimes Biopharma Laboratories Ltd. arrange training for the pharmacy shop keeper to get attention of them and the company train to those people about how they protect medicine from hamper, how they assort the medicine in their store, and how they find out the medicine in a very short time. The widely used gift item in pharmaceutical promotion is pen. Biopharma Laboratories Ltd. use over 100 types of pen to promote its product in market to the chemist, doctors, consultant, RMP, and other people who are involved with pharmaceutical distribution. Pad is a widely used promotional material for promoting every new and existing product with the basic information of the product. Sometimes the pad is printed for the RMP to prescribe their patient and it helps doctors to get knowledge overview about the product. Pad also work as a gift item for the pharmacy store and also the MPO of the company. Diary is other type of promotion used to promote the company as well as the company product. In diary the company name and addressed is provided at the top of it. Diary is provided to the high satisfied or high involved people of the organization. In pharmaceutical promotion their used several types of calendar to promote the company product as well as the company itself. The main types of calendar that are provided as a tool for pharmaceutical promotion are pocket calendar, wall calendar, and table calendar. The entire calendars are printed with the company name, logo and the head office address. Calendar is provided to clinic, hospital, medical center, doctors’ room, pharmacy store, and RMP chamber. Key ring is other types of promotion tools widely used in pharmaceutical industry. Biopharma Laboratories Ltd. widely uses this gift items to introduce its new product in the market and also the existing product. T-shirt is rarely used in pharmaceutical promotion. But some companies now use t-shirt to promote their product. With the help of t-shirt the company uses its product name and logo of that company they promote their product. Mug is mainly provides to the doctors, RMP, pharmacy, and the MPO of the company. The mug is designed with the product name and also the company logo. Wall clock is provided to different pharmacy store, medical center, hospital, clinic, and RMP with a purpose of promoting the company product as well as promoting the company itself. Bag is other types of promotion tools used by pharmaceutical company in our country and also used by Biopharma Laboratories Ltd. Bag is mainly provide to MPO, Internee doctor, RMP, and prescribe of the company product. Paper weight is provided to the doctors and RMP with the name of the product and the logo of the company to promote the product at the same time to improve the image of the company. There are also other gift items provided by Biopharma Laboratories Ltd. but they do not mentioned because those gift items are confidential. In pharmaceutical promotion sample is widely used and most of the time sample cost the highest for promoting a new or existing product. In terms of sample the company provides free medicine to the doctors and the RMP and also to hospital and clinic to prescribe their product and at the same time it also use this tools to capture more market share in the pharmaceutical industry. Sample is the most effective way for promoting a new product. Biopharma Laboratories Ltd. sometimes uses telemarketing in terms of promoting their products in international market. This method is not widely use in the pharmaceutical product promotion. Biopharma Laboratories Ltd. sometimes arranges contests among the MPO for selling more product in a specific region or in international market and provide incentives for those who win in the contest. Samples requires state licensing of wholesale distributors include minimum standards of storage, handling, and record keeping. It bans the re-importation of drugs product in other countries when re-imported by the manufacturer or for emergency use. It bans the sale, trade, of purchase of drug samples. It bans trafficking in or counterfeiting of drug coupons. It requires practitioners to ask for drug samples in writing. It prohibits, with certain exceptions, the resale of drugs purchased by hospitals or health-care facilities. Biopharma Laboratories Ltd. sometimes provide rebate to some clinic, pharmacy, hospital or RMP to increase the sales or prescription of their products. Trade show is the most effective promotion tools for promoting the company product in international market. Biopharma Laboratories Ltd. attends different trade show arranged by Bangladesh govt. or Export Promotion Bureau or Bangladesh Ousad Shilpa Shamiti and other country. Biopharma Laboratories Ltd. attend most of the trade show in country of abroad relating to pharmaceutical and this help them to promote their product. Biopharma Laboratories Ltd. attend most of the exhibitions held both in home or abroad and also they get more export orders from that exhibitions and it is considered as a tools for promoting the products in international market. Sometimes Biopharma Laboratories Ltd. use magazines for publishing articles and report related to their growth or their product in several pharmaceutical related magazines and it helps them to create a strong relationship with those who use these types of product. Biopharma Laboratories Ltd. sometimes donate or provide money or other items to help the society in any types of natural calamity or other disasters and it is referred as charitable contribution that creates a strong public relation. Sometimes there prevails some social issue which is harmful for the society and in that time there need some consciousness in that situation Biopharma Laboratories Ltd. use issue advertisement for promoting their own company and creates strong public relation. For example achieving consciousness for Soain Flue. Biopharma Laboratories Ltd. arrange several seminars targeted to the doctors, pharmacy owner, clinic worker, hospital worker and RMP for developing their skill to inform them in several issue for using several medicine or some special moment situation and all these help Biopharma Laboratories Ltd. to create a strong public relation in society. In times Biopharma Laboratories Ltd. arrange conference with foreigner to increase the export of the company product. On the other hand the company arranges conference with the renounce doctors to promote the company product and at the same time they arrange conference with the MPO and RMP to promote the company product. Biopharma Laboratories Ltd. arrange reception programs for internee doctors and sometimes foreigner who are visited to Bangladesh to know about the pharmaceutical sector of Bangladesh and also want to import medicine from Bangladesh and this types of program helps the company to expand the export market. These types of program help Biopharma Laboratories Ltd. to increase the public relations in market. Several month the demand for medicine increase and some month demand for medicine decreases. As the increase and decrease of demand Biopharma Laboratories Ltd. use two types of promotion namely off season promotion and peak season promotion. In off season promotion here the demand for medicine is lower than other period of the year. Biopharma Laboratories Ltd. increases the promotion in this season so that they can hold the demand of the peak season. If the company hold the demand of peak season in off season then the demand of peak season also increase. In peak season the demand for medicine is high and most of the pharmaceutical company are very much conscious about new market and gain the maximum market share in the market. So as the demand of medicine is higher than that of other month here Biopharma Laboratories Ltd. uses different special promotion program to keep pace with the market. Here the company increases its promotion budget to get more market share. Table 5.2: Monthly sales and advertisement expense. With the help of figure we can compare the relationship of sales and promotion expense of Biopharma Laboratories Ltd.
A promotional campaign’s target audiences may include academic professors, prescribers, hospital administrators, pharmacists, nurses, patients, the media, and the general public. Identifying the exact audience requires a thorough knowledge of customer needs, market characteristics, competitive activities, and the product’s own characteristics. Thus, the collection of secondary and primary data is paramount to this decision. Furthermore, the selection of a push versus a pull approach, the customers’ adoption stage, and the product life cycle are some of the important aspects of target audience selection. Determining each audience’s desired response also comes from the knowledge of their needs, wants, and purchasing behaviors. Multifunctional teams of a pharmaceutical organization, including marketing, sales, market research, and medical marketing professionals should evaluate these responses with each member. Deciding on promotional messages is also related to the customers, market, product characteristics, and promotional objectives. The latter may be image building, the product’s differentiation or positioning, or a direct customer response. It is one of the leading pharmaceutical companies in Bangladesh. It has one of the largest capital bases. Its portfolio includes product with very strong image. Innovative precuts which clearly provide market advantage. Field force is one of the best in industry. Field force produces differentiation in the market through strong product knowledge and skill. Continuously conducting seminar, symposia which is widely accepted by the prescribers. Innovative image building activities through different activities targeting patients. Developing service concept in a highly product oriented marketing approach in the industry. Conducting clinical trial in the country which is rarely practiced by other companies. Investing significant amount of money to train and develop physicians. It has a technological edge over its competitors. Highly skilled and motivated employee in head office and also in the field fulfilling the objectives. Introduce different types of medicine. Maintaining strict quality whatever may the cost. Maintaining strict guidelines for ethical promotional activities. SWOT Analysis of Biopharma Laboratories Ltd.
A widely recognized company with an attractive customer base. A proven tract record in defect-free manufacturer. Expertise in providing consistently good customer service. Skills in producing innovative products. Job flexibility so that the company has a group of loyal employees. Proprietary technology and registered trade mark. Attractive remuneration package and benefits for employee retention. Effective state-of-the-art plant and equipments. Highly experiences and efficient employees in key areas. Long term collective learning and managerial know-how. A positive work climate and organization culture. Cost of raw materials is increasing day by day. Countrywide distribution network is not as strong as competitors. Sarong adherence to ethics resulting in inflexibilities. Sometimes slow decision making to satisfy the process requirements. Serving additional customer group in the existing geographical market. Expanding into new geographic markets. Strength in export oriented products. Expanding the company’s product line to meet a broader range of customer needs. Transferring sector’s skill or technological know-how to a new business or a new product. To enter into new therapeutic area. Likely entry of the potential new competitors. Government regulation on price of drug. Adverse shift in foreign exchange rate. Growing bargaining power of suppliers. To discover, develop and successfully market innovative products to cure diseases, to ease suffering and to enhance the quality of life. To ensure that humanity continues to benefit from pharmaceutical innovation. To define an equitable way for sharing the economic burden of pharmaceutical development among the various segments of society. To ensure that research, development and application of pharmaceuticals are conducted in harmony with society’s ethical and cultural standards. Other key challenges include the issues of marketing practices, animals used in research and development, and accountability for our suppliers and contractors. From the study, it is evident that Biopharma Laboratories Ltd. adopts different strategies which create a sustainable advantage for the company. Approaches like personal selling with highly skilled field force, using highly lucrative sales promotion, creating strong public relations with its highly trained MPO and different arrangement by the organizations, creative and innovative advertisement materials, direct marketing with MPO, innovative products, service oriented approach, clinical trial, scientific meeting for customers, patient’s connectivity, image building activities etc. clearly provide sustainable position in the industry despite many adverse market conditions and hostility by the competitors. The model and approaches can be adopted by other leading companies to find a relatively comfortable path for doing business; of course modification may be needed for adjustment according to company internal situation. From the above discussion promotion, promotional mix, communication strategy figure also help in deciding which promotion tools should use. It is evident that Biopharma Laboratories Ltd. will be maintaining its position and also trying to gain a competitive market share by implementing innovative strategies in the coming years as it is demanded by the highly competitive local and global pharmaceutical industry environment. Biopharma Laboratories Ltd. should presence more in the district town and in some important rural areas as these markets is still untapped. Though the products of Biopharma Laboratories Ltd. are cost effective than that of rivals, still opportunity for institution based sales should be looked into. More strategies collaboration with other foreign manufacturers is needed to gain access to technology and resources for example go production for APIs. More flexible functional policies are needed to match the changing environment of the industry. Patent right protection is mandatory to do business in LDCs market. Looking for cost effective sources of raw materials to bring down the product cost. Acquisition of local or global firms to add strong growth. Diversification in product wise indication through clinical research to earn more business. More emphasis on service oriented approach to overcome price objection by doctors through relationship building. Field activities among younger generation of prescribers which will help to build potential future prescribers. To further develop and strengthen institution business through innovative product. Which steps should be taken by Biopharma Laboratories Ltd.? 1 Medicine and disease related information: the doctors often ask for this scientific information to better understand the disease and to facilitate better patients’ management. Biopharma Laboratories Ltd. is trying to provide such information because of its distinct capability in research and development field. Doctors perceive this service to be value adding and thus the image of Biopharma Laboratories Ltd. in this field is very high. 2 Information on new medicine: this is and exceptionally value adding area where very few global pharmaceuticals are able to develop new medicine. Biopharma Laboratories Ltd. is one of the leading pharmaceuticals which have a very strong communication and often regarded to be one of the best in this field. Upon request of the doctors, Biopharma Laboratories Ltd. furnishes this information which is regarded as value adding scientific activities. 3 Establish research center: Biopharma Laboratories Ltd. should establish research center which will be dedicated to conduct research on different incurable diseases. While conducting such research, many information are generated which definitely enrich the knowledge of the doctors. 4 Future direction for better treatment: Biopharma Laboratories Ltd. also provide information to doctors through seminar and symposium regarding future prospect of the treatment and how the treatment paradigm is being changed so that the doctors can keep themselves abreast of this rapidly changing treatment environment. Biopharma Laboratories Ltd. is undoubtedly a pioneer in this field. 5 Standard protocols for systematic disease management: Biopharma Biopharma Laboratories Ltd. works with different key opinion leader of the world and also with different global regulatory bodies and formulates protocols and system to treat a disease. The most recent work has been done to treat the hypertension where the total disease has been redefined in the context of recent findings across the world. The protocols really help the doctors of the third world countries to cope with the changed treatment pattern. 6 Comparative study among different drugs: Biopharma Laboratories Ltd. conducts different comparative study between the existing molecule and its newly developed drug to document the superiority interns of better efficacy and lesser side effect profile. This information are presented to the doctors from time to time to help them for decision making regarding selection of appropriate drug for the patients. 7 Making product more accessible by the patients: Biopharma Laboratories Ltd. always try to making their product more accessible to their patients. They frequently invent different types of medicine and bring those medicines in the market within short times. They always look how customers will benefit. 8 Raising awareness of patients regarding disease: Patients are the ultimate consumers and thus they have the right to understand regarding the disease. It has been found that proper information and education of the patients realty help to reduce the disease burden and make the patients more aware about the treatment continuation and disease prevention. Biopharma Laboratories Ltd. is one of the few companies in the country which systematically interacts with the patients through different interactive sessions and makes them aware of the patients. The interactive sessions are in the form of discussion, seminar, round table discussion, holding rallies, printed materials like booklets and journals. Thus it is not only the doctors with whom Biopharma Laboratories Ltd. has been partnering; patients have also become a part and parcel of health promoting activities on Biopharma Laboratories Ltd.
9 Prepare and update technical guidelines: Biopharma Laboratories Ltd. prepare and update technical guidelines for management of a leprosy control program, monitoring, validation, etc. several of these guidelines have been translated into the local language and extensively distributed to the most peripheral levels. 10 Develop and implementing protocols: Biopharma Laboratories Ltd. develop and implement protocols to undertake studies for analyzing and validating case detection, as reported by routine information system. 11 Promote and support campaign: Biopharma Laboratories Ltd. promote and support special campaign to accelerate elimination activities in selected high endemic pockets, underserved communities and previously uncovered areas. Bangladeshi-American Pharmacists’ Association Journal 2006, 2007, 2008. Annual Report of Biopharma Laboratories Ltd. 2006, 2007, 2008 & 2009. Annual Report of Ministry of Health and Family Welfare. Research paper from Ministry of Health and Family Welfare. Report from Consumer Association of Bangladesh.